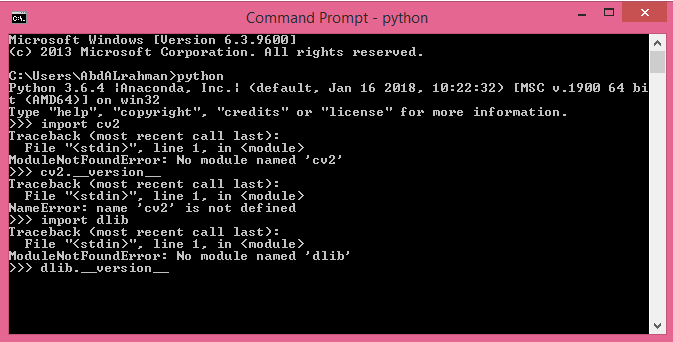 We already have a post for installing OpenCV 3 on Windows which covers how to install OpenCV3 from source for working with both C++ and Python codes. However, many readers have faced problems while installing OpenCV 3 on Windows from source. 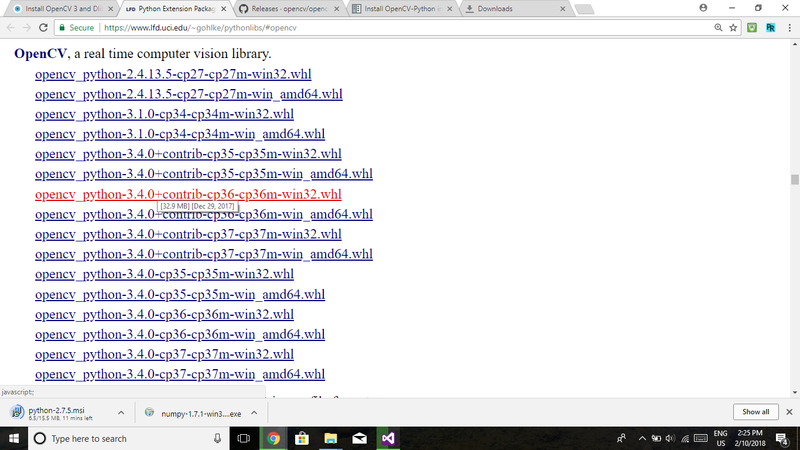 This post is for those readers who want to install OpenCV on Windows for writing Python code only. Download and install Anaconda 64-bit version from https://www.continuum.io/downloads. 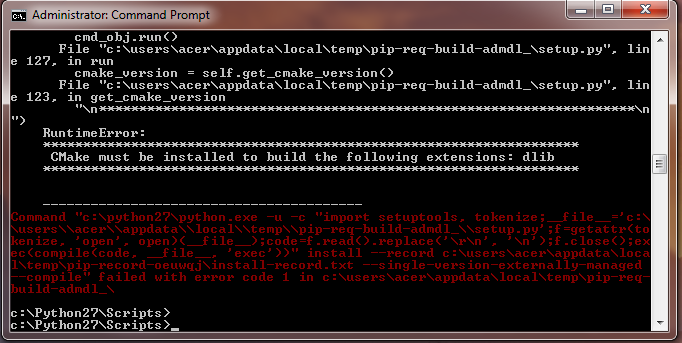 It is advised to install Anaconda for Python 3. Open the command prompt and execute the following command. # See how the (opencv-env) appears before the prompt after this command. If you liked this article, please subscribe to our newsletter. You will also receive a free Computer Vision Resource Guide. In our newsletter, we share OpenCV tutorials and examples written in C++/Python, and Computer Vision and Machine Learning algorithms and news. Why not “conda install dlib opencv -c conda-forge”? When I follow this procedure I still get the error: AttributeError: module ‘cv2’ has no attribute ‘SIFT’. I thought SIFT and SURF were included in the conrib package? Any hints and tips on how to add SIFT and SURF? 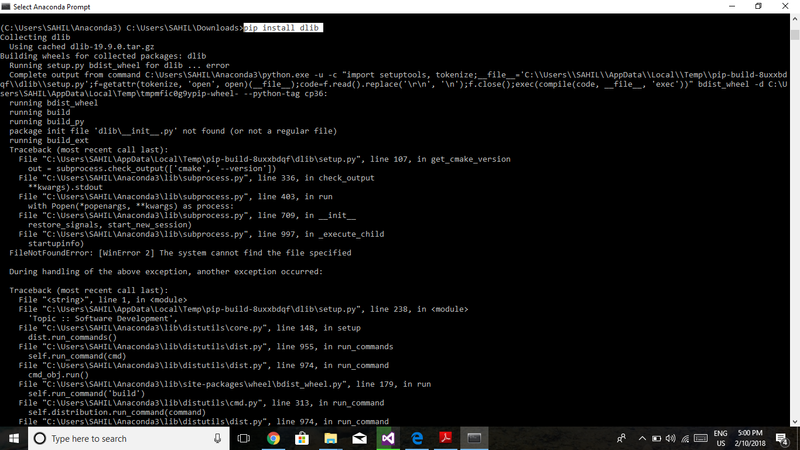 I´m install opencv_python-3.4.0, but whe I activen open -env, i receive the message:() 1>&2 Error: did not expect more than one argument. someone can help me? I can’t install dlib as I got this error msg : ” Failed building wheel for dlib”. Any idea on what to do next ? that page gets 404 error, is there another link that you could provide? Thanks a lot. I have been struggling for so many days. This really helped. i really help me.. i have been struggling for so many days. I had same problem. In my case dlib could not install without cmake working while cmake could not work without c++ runtime installed. So I ended up going back to adding C++ to Visual Studio like it says in Step 1 on https://www.learnopencv.com/install-opencv3-on-windows/. After that dlib installed. Thanks Piyush , it worked for me. please some one can help fix this problem ? it’s two underscores each: _ _ version _ _ (without whitespaces). Best way to install python with opencv is using pycharm. That i have shown bellow. 1.download and install pycharm community addition. 2.create new project in pycharm. 4.search for interpreter in searchbar.find the green coloured ‘+’ button from right side to add new interpreters. right everything installs except dlib. I dont understand…why here these guys trying to install dilib…? Wow, I spent SO much time trying to get dlib to work. Your tutorial did it for me. After so much frustration, I couldn’t believe that it finally worked. Thank you so much for this nice and easily understandable explanation! How to install dlib use GPU on windows? for dlib installation which is the last and most painful installation. i found out from other post. this works. Thanku so much your method for dlib installation worked in my window7 os. I got an error, what should I do? Do some one know? Please help me!!! and after that the dlib started to build. I am using pycharm. What are the steps of installation on pycharm? At the last check im having this issue diferent form the example any clue? can u help me fix it? thank a lot!